Mung ki daal is the most frequent daal in my kitchen. 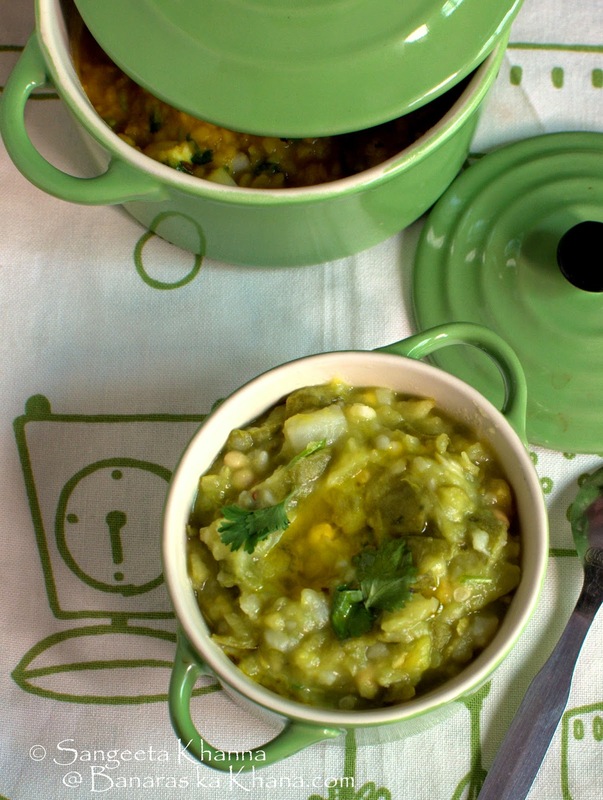 Not only it cooks faster, I like the taste too and the simplicity with which I can dress up this daal into anything I want. I make it into a sookhi mung ki daal sometimes and add some methi sprouts to mung daal some other times. Mung ka dhokla is a recipe I repeat frequently for our evening snacks or weekend breakfasts. But the most simple thing I do with dhuli mung (skinned yellow mung beans) is just to pressure cook it and add some chopped tomato onions and have as it is. I love it as a soup, snack or a meal whatever way I need it. This way of dressing boiled mung ki daal with just a few chopped raw onion and tomatoes is a very common way of cooking the daal in western UP, specifically Muradabad. 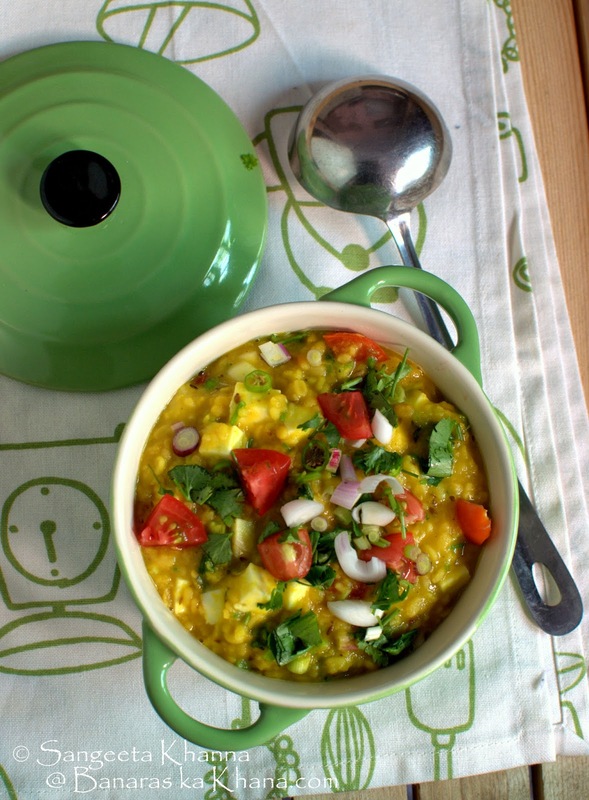 My sister's mother in law makes this daal and everyone loves the clean flavours of this simple daal. The most wonderful thing is that there is hardly any recipe to note down. But let me warn you that the simpler recipes need to be accurate to make sense. Mix everything listed under 'to pressure cook' and pressure cook till the whistle blows up. Switch off the flame and let the pressure cooker rest till ready to be opened. Depending on the size of the pressure cooker, the daal will be thick and done or it may be a little al dante. Let the daal simmer without the lid if needs more cooking but only till it gets thick and done, not mushy or pasty. Add the bhuna jeera (roasted cumin) powder and half of the chopped onion and mix. 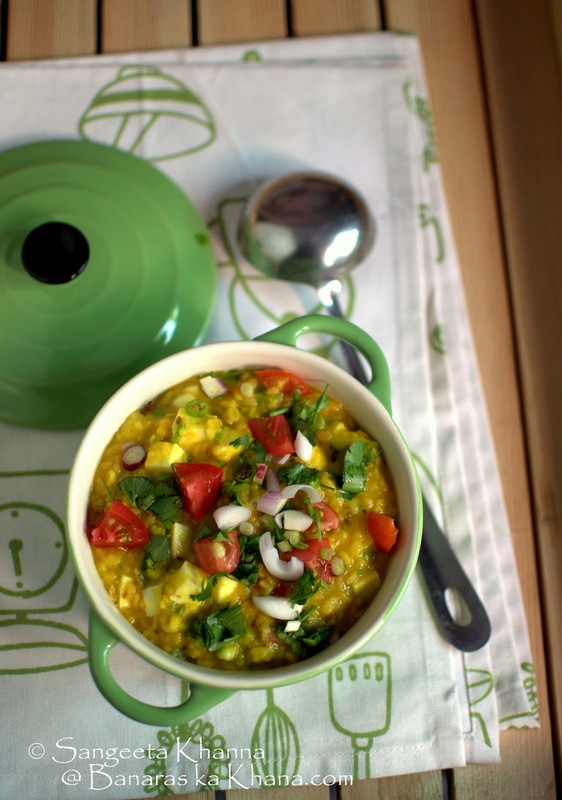 Pour the daal in individual bowls and garnish with the remaining chopped onion, tomatoes and dhaniya patta. Drizzle with ghee and serve hot. I usually make some bharta or chokha with such simple light meals, mostly when we are home after a long travel or have eaten out a bit. Light home cooked meals serve well on such occasions but I can live on such meals even in my everyday life. This time I had made this Parval ka chokha that I love to bits and keep repeating it till the parval season lasts. Again the recipe is very simple but needs to be accurate to give the same results. Mix the ingredients for pressure cooking and cook till the first whistle. Let the pressure cooker rest till ready to open. Mash the boiled vegetables with the help of a potato masher or the back of a serving spoon. Add all the ingredients to finish and serve right away. This parval ka chokha keeps well for a couple of hours at room temperature and tastes great with daal and multigrain rotis or with daal and rice meals. Try and cook this mung ki daal and parval ka chokha together whenever you need a light meal to cleanse your body of overeating, festive eating or eating out. 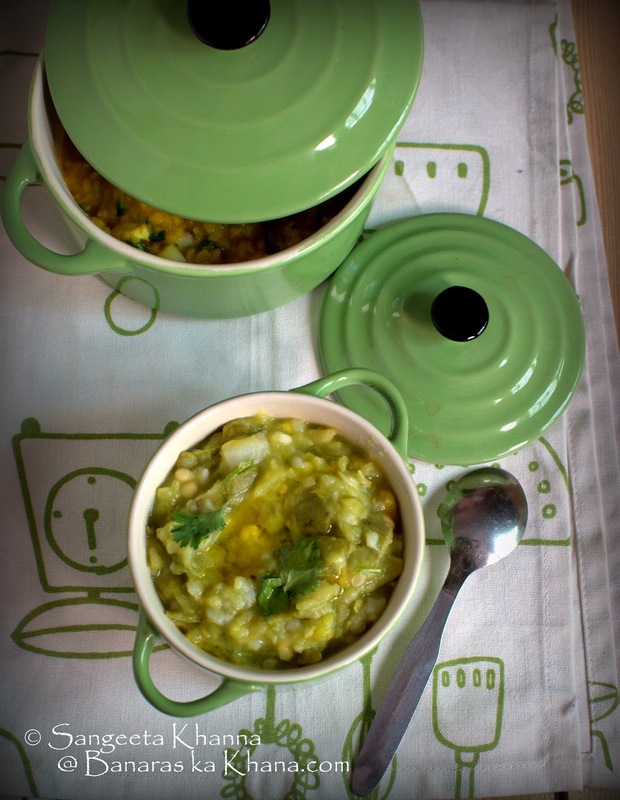 Or just to have a pleasure of simpler warm meals cooked at home. I assure you wont be disappointed. Both these Muradabadi mung ki daal and parval ka chokha are one of those foods that I eat in large amounts. Often without any roti or rice to go with it. I am sure you know it already if you have been reading my blogs for some time. I am glad you liked this moradabadi mung ki daal Astha :-) Do let me know when you try parwal ka chokha too. thank you.